Buy Aroma Magic Help Me! 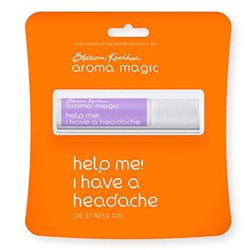 I have a headache - De Stress Oil - relieve headache, relax, de-stress & freshen up to face. An aromatherapy formulation made from essential oils of lavender, basil and ginger. Potent blend of pure and natural oils soothes your nerves to relieve headache. It also help you to relax, de-stress and freshen up to face the day or sleep peacefully at night. Safe and natural with no side effects.